One of the major advantages of concrete pavers is that they allow you to be very playful and free with the designs of your project. You are not limited in shapes, colors, and patterns as you are with more popular paving materials like concrete and asphalt. Of course, this doesn’t mean that you have to create some complex pattern or design if you don’t want to; sometimes simpler is indeed better, both for your budget and for the look you’re trying to create. The deal is, of course, that you at least have the options available if you so choose to pursue them. This article will give you a general overview of some of the design possibilities available for your next project, whether it be a driveway, patio, walkway, pool deck, landscape, or garden creation. Consider adding some of these ideas to your paver designs. Note that some of them will require extra expense, as noted in the description, so if you’re on a budget you’ll have to be careful not to go too nuts. Still, you can add some interesting flairs to the design often without increasing the cost. Note that these designs apply to all types of pavers. Whether they are concrete pavers, brick pavers, natural stone pavers, plain bricks, or others, you can use your creativity to apply these patterns and designs with one or more materials, some of which have not been mentioned here. Note that some of the options may work better with one type or the other; for instance, brick pavers are hard to cut, so designs that require curves and heavy cuts may be challenging with this type of material. Changes in Elevation: How your pavers react to changes in elevation may depend on the actual changes in grade, but consider the options here for how you may want the pavers to ascend or descend that grade. (For instance, check out this article on the raised paver patio.) You could go with small steps, medium sized landings, or something else. Obviously, a lot of this will depend on the specific physical and engineering needs of the project, so consult with a contractor/engineer if the design will incorporate heavy changes in grades (i.e. slope or elevation). Curves: Adding curves to your installation gives your walkway (or other project, use your imagination!) elegance and sophistication. Many paving stones designs and brick paver designs work better with curves. Patterns: As described on other pages here at the CPG, the patterns (particular ways to lay the brick, like herringbone patters) available are varied, and depend on the shapes of the brick your purchase. Some patterns will look better than others given the dimensions and scope of your paving stone designs, so be sure to consider all options available to find the best fit. The pattern you select will determine how the eye will or will not be drawn to the project, and thus whether or not the project will be the ‘centerpiece’ or the ‘complement’ to the rest of the landscape and hardscape. Circles: Adding circles of varying sizes to your patio, driveway, or poolside is a great way to spruce up the beauty of your home. 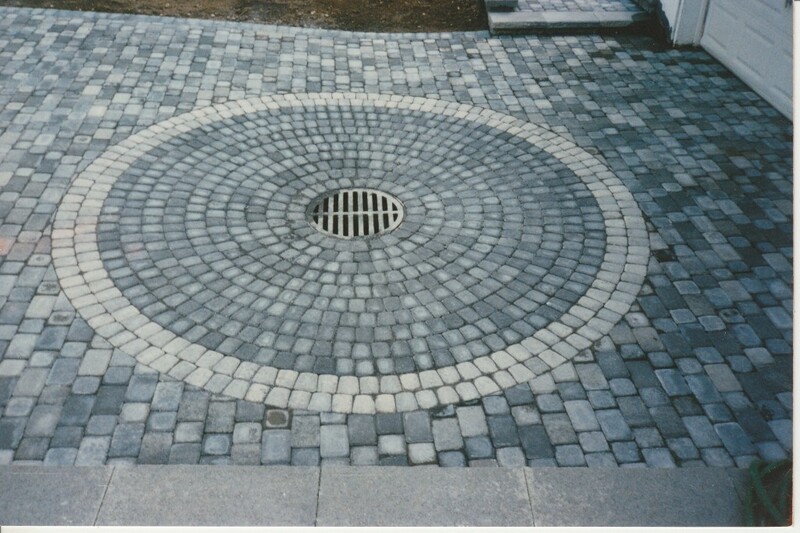 To install concrete paver circles you will need to have a circle kit. Each company makes its own kinds of circle kits, often in limited colors, so you’ll need to ensure that the color and style of paver you select for the patio or driveway as a whole has an optional circle kit that you can purchase. Installing a circle kit can be challenging, as it has to be laid from the center out to be done properly. Engraved or Illustrated Pavers: You can get pavers and paving stones with certain designs either engraved, painted, or otherwise layered on the surface of the brick. This could be a fun addition to your outdoor patio or driveway, for example. 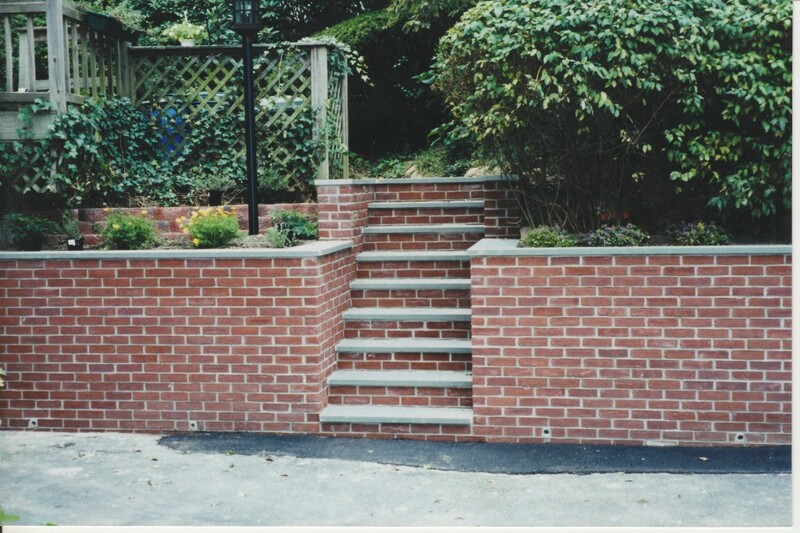 Walls: One way to spruce up your concrete and brick pavers designs is to add walls. Some walls are purely functional and are installed as retaining walls to keep back dirt or line the bottom of a hill. Some walls, however, can be purely cosmetic, integrated closely with your design. Often paver companies sell wall stone in the same color and style as regular concrete paving stones, so probably be able to match up the components either perfectly or by using complementary colors. Waterfalls: Adding a custom waterfall to your backyard or pool setting is a great way to add style and taste to your patio or pool deck. The engineering for a waterfall is a bit more complex than usual paver installations, so you will probably have to call a professional (and your contractor may have to sub-contract out the water work). Fire Pits: A great addition to a backyard patio, a fire pit is a great way to add some campfire fun right at home. Certain regulations may apply for installing this fire pit, so definitely consult with a contractor. Steps and Stoops: Adding a new set of steps or a stoop to your home entrance may be a great option for you, especially if you are installing a walkway to your home. You can often use the same pavers for the stoop as for the walkway, with a few minor additions to complete your concrete pavers designs. Don’t forget to add concrete balusters where needed to give people a place to grab on to when walking through the area. Enclosed Areas: Keep away from the sun and rain by enclosing your patio, either with a permanent structure or with a removable tent or overhang of some kind. Read more in this article about the enclosed patio. Landscaping: This is an entire subject on its own, so I won’t cover it here. For more information, check out these articles, such as this one on landscaping rocks. Safety First: Of course, what looks nice may not turn out to be safe. Never compromise with safety, not only to protect against physical harm but also to protect against damage to your home and property. Mixing and Matching: You can also mix and match the materials and design possibilities mentioned here for an integrated, well-thought out look for your front or backyards. This entry was posted in Design Ideas and tagged brick paver designs, concrete paver designs, design, paver designs, pavers designs, paving stone designs, paving stones designs by Will Grander. Bookmark the permalink.